It's Father's Day today, and today's BookADay topic is 'Favourite fictional father'. at first I found this category quite difficult. My own dad is so brilliant that he completely out-heros any father from fiction and no literary dad could ever live up to him - plus, my first instinct was to pick William from Danny The Champion of the World, and I've already talked about that book during this challenge. And then I remembered Moominpappa. I love the Moomins so much that I sometimes think it's possible I might actually be one, and Moominpappa espouses everything about Moomins that I adore. An orphan who grew up in a children's home, he is a deeply independent and somewhat lonely character, prone to bouts of wistful melancholy and an urge to wander, yet for all this he is a kind, gentle and responsible father to his Moomin family. He is drawn to the sea, and to seeking knowledge, taking to the waves for a stay with the Hattifatteners at one point so he can observe their strange behaviour. A tolerant, thoughtful sort of character, he is a strongly individual type, and always wears a top hat, a gift from his wife with an inscription inside to distinguish it from any other common-or-garden top hat you might come across. 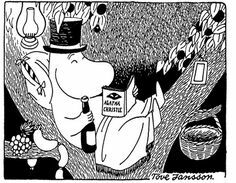 Here's Moominpappa with his book, his pillow, his hat and a bottle of wine ... clearly a Moomin after my own heart.